3. 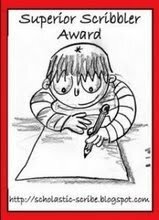 Each Superior Scribbler must display the Award on his/her blog, and link to this post, (http://scholastic-scribe.blogspot.com/2008/10/200-this-blings-for-you.html ) which explains the Award. Let’s see if some of my five respond. Some, I’m sure, don’t even know I stop by their blogs. I'm honored to be in such talented company. Thank you, Linda! Thanks so much, Linda! This is such a boost!